Dialing in your suspension is very important to achieve ultimate handling. Getting the proper balance of over and under steer will enhance your cars handling performance. 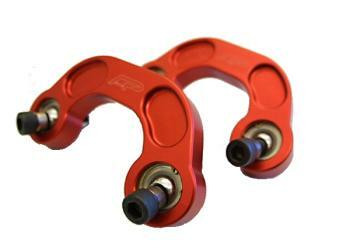 Factory sway bar links are a urethane material that flexes heavily under load. Agency Power has redefined suspension handling with these replacement sway bar links. These links will stiffen up your rear end of the car and give you the proper handling you need. The Agency Power Sway Bar End Links are CNC machined 6061 aluminum that is to the exact same specs as the factory for a no hassle fitment. Unlike the competition, the Agency Power sway links are much thicker for strength. The end links include monoballs that are sealed and held in place with C Clips. This allows you to clean and maintain if necessary. As well, the Agency Power links include high strength steel hardware, stainless steel collars, and nylon locking nuts for a secure fit. Each end link is laser etched with the AP logo and sold as pairs.